Here is the debut album for the Swiss five-piece band, Climax. As you can guess by the title, Play Some Heavy, and by the artwork, these guys play classic, unrestrained heavy metal. Formed in 1998, the band saw some lineup changes before settling on the 5 young rockers that appear on this album. Fans of NWOBHM stand up and take notice. These guys rock, and Play Some Heavy shows some serious promise. Play Some Heavy is an energetic release, firmly based in the NWOBHM sound, splashed with an early Motley Crue attitude. Having said that, it should be no surprise that the songs are dominated by loud (and very good) guitars. Roger Buchmann and Mario Schnidrig deliver a nice mix of driving metal riffs and hard rock grooves that never gets tired or dull. Let's not forget the numerous extended solos that promise to make your neck sore by the time the album is over. Vocalist Michel Lagger has a rough, yet powerful voice that gives the overall sound a huge kick. Lagger's vocals are what really give this band a unique sound. Let's face it, lyrics such as "Get me to the top, I wanna rock, never stop, I lose control, I bang my head, heavy metal I am fed" aren't exactly original, so extra attention must be placed on execution and songwriting in order to succeed. In that respect, Climax is definitely on to something worth listening to. The songs are interesting from start to finish, although some (The Extremist, Superheroes, and Break) stand out above the others. There are no dull moments, and I like the fact that no song sounds like a carbon copy of another. 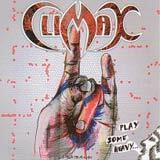 Climax runs the spectrum from Paul Dianno era Maiden to hard rocking Too Fast For Love era Motley Crue. Like I said, the guitar work is excellent, the rhythm section is tight and forceful, and the band has a charismatic frontman to top it off. It is obvious that the production is low budget, but the raw sound seems to fit this type of music. The guitar work could have been a little bit higher in the mix, but this is a trivial complaint. Naturally, those of you who yearn for something new and original won't find it here. However, those of you who refuse to let go of the glory of the NWHOBM sound will want to check this band out. Fortunately for us fans, this is not a second rate, stale rendition of bands from yesteryear. Climax plays their music with guts, and has the musical and songwriting talents to make some noise on the scene.